When Fran Sol left Willem II for Dynamo Kyiv in January, the Eredivisie side were left in a bit of a pickle. The Spaniard netted 13 goals before his move to Ukraine, as he shouldered a significant portion of the goalscoring burden for the Dutch side. Indeed, replacing Sol was the immediate port of call at the turn of the year and a failure to do so would’ve dented their chances of a Europa League playoff finish. They took a risk, then, by bringing in Alexander Isak to replace Sol. Borussia Dortmund signed the teenager from AIK in January 2017 and penned a five-year deal upon his arrival. However, Isak has made only five league appearances, four of which have come from the bench, with Borussia Dortmund and a move away from the Bundesliga came as little surprise as both player and club strived for the Swede to earn regular game time and realise his immense potential. Yet with a lack of action at a senior level, Willem II’s decision to take Isak to the Netherlands was a gamble. With very little match fitness and no goals to boot, there was ample pressure on the 19-year-old to hit the ground running. Three successive league appearances, two of which were starts, without a goal suggested Willem II had made a mistake in tasking Isak with leading the line in their favoured 4-3-3 setup. Isak netted his first league goal in Willem II’s 3-2 loss at Vitesse, but a blank the following week in their 2-1 win over AZ suggested that strike was more the exception than the rule. Another goal in the KNVB Cup over AZ at the end of February, though, kickstarted a wonderful run of form that has seen Isak shoot back into the spotlight across Europe. Indeed, since his goal in the cup game, he has scored in eight successive Willem II outings and has 12 league goals to his name; no player has netted more in the Eredivisie in 2019. Combined with his four assists in that time, since Isak made his debut for Willem II, he has had a direct hand in 16 of their 28 league goals. On top of that, those goals and assists have been worth an additional 14 points to Williem II, who have picked up a total of 21 points since his first Eredivisie appearance in the 1-0 win over FC Utrecht. 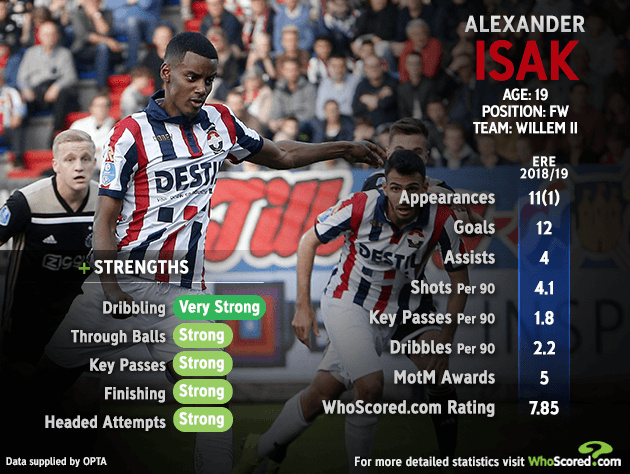 His impact in the Netherlands can’t be overstated and Willem II are now thriving in the league and very much in the running for a Europa League playoff finish, with Isak spearheading their charge. Landing a WhoScored rating of 7.85, it’s the seventh best in the league when removing the minimum apps filter and having won the WhoScored man of the match award in five of his 12 appearances, that return puts him fifth in the standings, with a standout performance coming in Willem II’s 4-3 win at Heracles at the beginning of April, where Isak scored two and assisted two to land a perfect 10 rating. It isn’t just his goals that have won admirers in the Netherlands either, with Isak returning 1.8 key passes and 2.2 successful dribbles per 90 for Willem II with the striker showing the type of form seen in Sweden that convinced Borussia Dortmund to sign him in the first place. When the Bundesliga side acquired Paco Alcacer last summer, he must have seriously considered his future in Germany, even with a side that have previous with developing young players. Dortmund, though, must be rubbing their hands together and wondering what Isak could bring to the team next season as a possible understudy to Alcacer. The Spaniard’s injury issues could present Isak with further game time and a real chance of making a name for himself in Germany, or at the very last, land the German powerhouse a hefty profit, with Real Madrid and Chelsea among those casting watchful glances across to the Koning Willem II Stadion. Lazy tags describing Isak as the next Zlatan Ibrahimovic didn’t help his cause, yet he has shaken off the comparisons in a bid to become a star in his own right and it’s thrust the forward back into the spotlight. With just four games to play of the regular season, and four points separating Willem II in eighth and FC Utrecht in fifth, Isak will be confident of firing the Dutch side towards Europe and glory next month, too, with William II up against Ajax for the KNVB Cup. For Isak, though, re-establishing himself as one of Europe’s hottest young striking talents was his priority after dropping off the radar following a breakthrough campaign with AIK. Despite arriving in January, if he continues his rich vein of form between now and the end of the season, and perhaps into the playoffs, then he could rightly be considered one of the signings of the campaign as his stock soars once more.